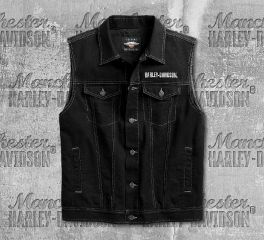 Harley-Davidson denim vests for men can help protect riders from small debris, bugs, and exposure to the sun – all with legendary H-D fashion and function. 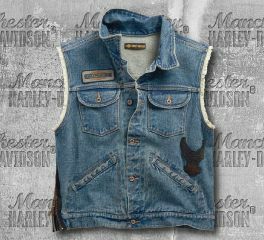 Harley-Davidson® Men's Embossed Upright Eagle Denim Vest is made from 100% cotton twill is stonewashed for softness. Cotton twill lining. It features button front, button flap chest pocket, snap hand-warmer pockets, snap-down collar, button waist tabs, embroidered graphics, and embossed leather patch. The embroidered patch and felt appliqué lend vintage appeal to the Blowout Slim Fit Denim Vest. This classic silhouette is authentic right down to the frayed armholes. Need a layer over a tee or hoodie? Reach for this men's casual vest. Pockets: Snap hand-warmer pockets. Button flap chest pockets. Design Details: Stonewashed for softness and vintage look. Frayed raw-edge armholes. Snap-down collar. Button waist tabs. Side zipper. Graphics: Embroidered patch and felt appliqué graphics. 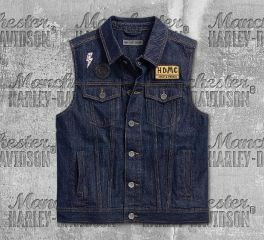 Harley-Davidson® Men's Dark Indigo Loud & Proud Slim Fit Denim Vest is made from 100% Cotton denim. It features a button front, two hand-warmer pockets and two button flap chest pockets. Chunky, oversized buttons. Embroidered patches on front. Slim fit cut that is narrower throughout. Like it roomier? Size up. 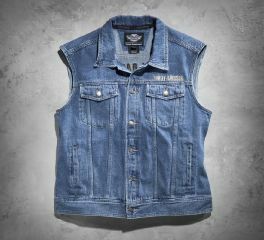 Already a symbol of tough, the denim vest gets an extra kick in the Bar & Shield Logo Denim Vest.